Exit I-75. Go east on State Road 52, about 10 minutes to the entrance to St. Leo Abbey. After you go down and up the hill on the frontage side road, you will come to the abbey. The US Post Office for St. Leo, Florida is also in the abbey parking lot. Founded in 1889. This Catholic Benedictine Abbey follows the Rule of St. Benedict compiled in 530 AD. 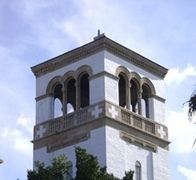 Visitors are welcomed as Christ and the abbey has an active spiritual retreat program. Come by yourself or with a group. The abbey also has an oblate program for lay people wanting to live a more monastic life. This map was created by one of the oblates at St. Leo Abbey.